The bride at this particular wedding wasn’t enamoured with her flowers and was at the point of pitching them into the nearest bin so I thought we could have a bit of fun with them in a photo. My briefing was possibly lacking in detail and direction so instead of all five bouquets sailing over my head and beautifully captured in flight, the shot below happened. One bouquet went straight up, two over my head (well done those bridesmaids! ), one stayed in the hand and one hit me. 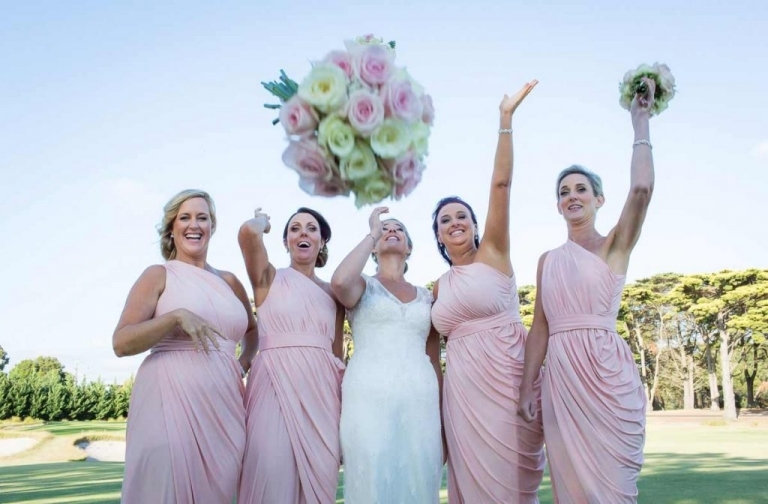 In case you’re interested, a wedding bouquet travelling at speed following a lob from an enthusiastic bridesmaid hurts. Luckily I was fine, but a less muscular and rugged wedding photographer could be injured! Are you getting married? Click here to chat to me about your wedding photography plans.